Protect the rocker panels and lower body of your Jeep Wrangler JK in the roughest terrain with a set of genuine Mopar Rock Rails. 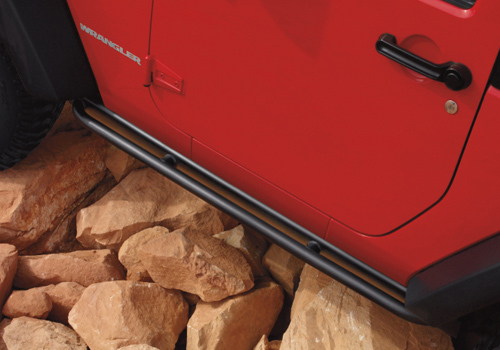 These Rock Rails are constructed of heavy-gauge steel tubing to stand up to tough off-road conditions. 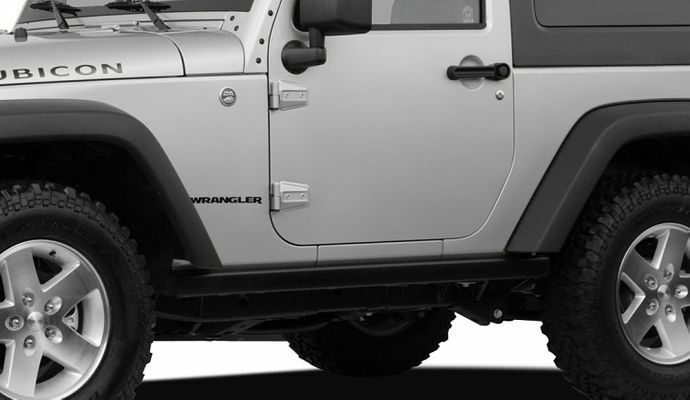 They're available in two versions: The Rock Rails that come standard on the Rubicon edition and Rock Rails with the tubular rub rail. Both have a textured black satin finish and bolt to existing mounting holes with reinforced mounting brackets for easy but strong installation. After a lot of research I decided to go with these rails. They are tough, and bolt on, no drilling and no removing existing bolts. On my 2014 Jeep Unlimited the holes are already tapped to accept the bolts so I did not even use the tapped inserts the rails came with. They look awesome, are very solid, and do not decrease ground clearance. Pros100% bolt on, no drilling, covers pinch seam, heavy duty, does not reduce ground clearance. ConsDoes not stick out enough to act as a step.